Google has certainly had an interesting week, what with co-founder Sergey Brin touting Google Glass as the next big thing for alpha males, and moving up the release date of the augmented-reality specs. Not to be outdone by Brin, Google's Chief Financial Officer and Senior Vice President Patrick Pichette took time during his talk at the Morgan Stanley Technology Conference to put Motorola on blast. Yes, even though Google purchased Motorola Mobility back in 2011, the internet search giant and Android OS provider isn't exactly thrilled with what it's inherited, according to Pichette. Motorola, Pichette said, had 18 months worth of products to roll out when Google took over formally last year, which included the already announced Droid Razr Maxx HD and Droid Razr M.
We've heard about this 18-month backlog before as part of the reason why Google hasn't yet produced a phone with its acquisition. Though both these Droids have fared well enough both critically and commercially, Pichette didn't shy away from expressing his exasperation with what he's seen and what's yet to come. 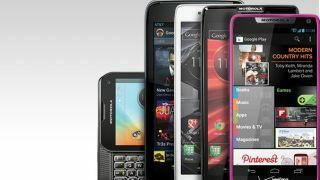 "The case with Motorola is that we've inherited a pipeline," Pichette said, according to The Verge. "Motorola has a great set of products, but they're not really like 'wow' by Google standards. Dennis Woodside [CEO of Motorola Mobility] and his team have inherited 18 months of pipeline that we have to drain right now." Not exactly a ringing endorsement of the company rumored to be helping Google develop its own device dubbed the X Phone. Motorola's inability to impress Pichette isn't necessarily surprising, but the way in which he acknowledged his disappointment so publicly was a bit shocking, especially considering whispers that Google and Samsung are on rocky ground. However, Pichette was quick to dismiss any controversy brought about by the claims Google and Samsung aren't seeing eye to eye, and claimed both companies have a "terrific relationship." Needless to say, we're curious what Google has planned for Motorola after that 18-month pipeline has been drained, particularly with Samsung's Galaxy S4 slated to unveil at the Unpacked event on March 14. The bar could be raised rather high, and Google is certainly going to want to show up with its next phone, or maybe consider getting a new manufacturing partner.